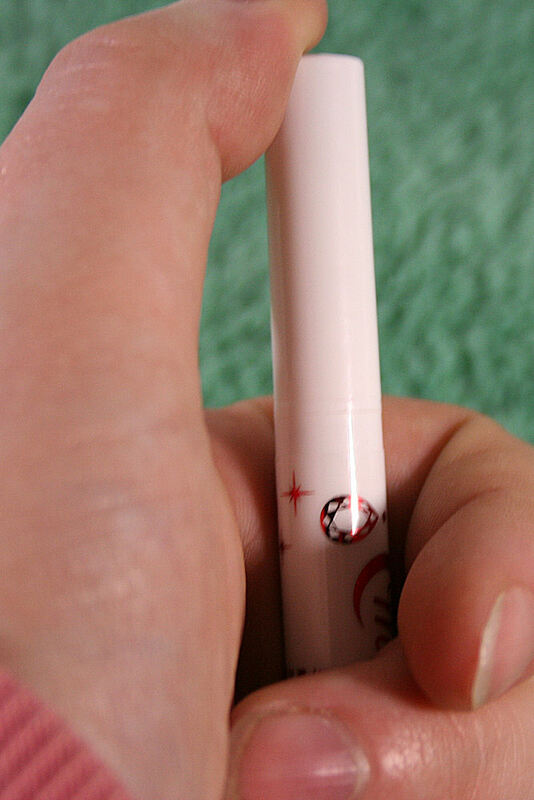 Star Power Prism Eyeliner – MoonFigures Collection, Art, and Reviews! 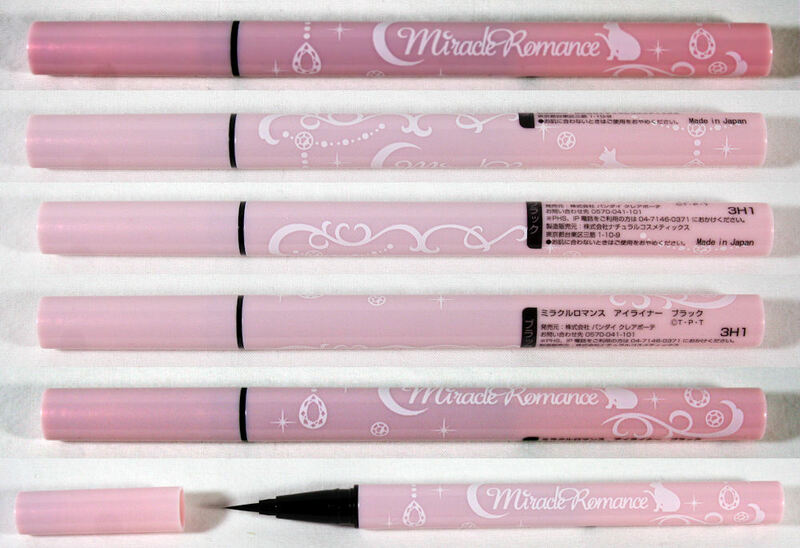 The Star Prism Power Eyeliners are a part of the Miracle Romance line from P-Bandai’s Creer Beauty series and are part of the 20th Anniversary Sailor Moon merchandise. They come in 5 colours: Black, Brown (tea), Blue, Red and White. Black, brown, and white are adorned with silhouettes of Princess Serenity, blue with Sailor Mercury, and red with Sailor Mars, but the line has shown no sign of equivalent pieces for Jupiter or Venus yet. Eyeliners were released both individually and in 2 limited edition sets containing 3 eyeliners that complimented each other. The white pencil was the only eyeliner included in both sets. Production of the boxes were limited to 2000 each, while the eyeliners themselves seem to be much more mass produced and available in stores. Advertising for these online has been nearly completely viral marketing by fans outside of Japan. Official releases were made on Sailor Moon Channel, P-Bandai, and Creer Beaute, and that seems to be it. In Japan displays have been set up in stores selling the eyeliners, and there is also an unscanned magazine ad that has been found, but not posted in whole. The boxes are surprisingly sturdy, although for Mercury, Mars and the White box they have a panel that bends around the box and is sealed with a tab into a slot, and a sticker. This bulges around the box, and is not flat like the black and brown boxes, so it’s possible for this part to bend and crease during shipping if not properly packaged. The boxes on their own are beautiful, classy, and well designed, using various Art Nouveau motifs that are repeated and recoloured to represent the Senshi. The designs are surprising, considering the amount of flowers, bows, stars, pin stripes and curling girly fonts used on the box. It is overflowing with girly stereotypes, but they’re used expertly and well represent Sailor Moon, and her older fan base. The black and brown boxes are rather large for no other reason than to make room for the outside flap on the box with additional aesthetic appeal. Be careful when opening this box style. The round 20th anniversary logo is actually a sticker holding down the flap. The back of the boxes including the Toei stickers. The liquid itself applied nicely and lasted through the night. I tested the water proofing both on my eyes and in the shower with just a marking on my hand. The shower test removed quite easily (although it wasn’t applied for more than 5 minutes), but the test on my eyes after all night seemed to hold well enough. The brown liner applicator and liquid match similarly to the black. The colour is a little more transparent, though application to the test strip seemed good. Application, waterproofing, and last is comparable to the black liner. Although I’ve only used the blue liner during opening and testing on paper and my hand I am confident in saying that this will be slightly different than using most liquid liners. It’s VERY thick, and oozes upon initial opening and pulling the liquid to the tip. It’s very bright, and the brush will help maintain decent lines. The liquid should be usable, but I find the colour event specific. It might be better for raves or cosplay, unless you dress colourful and out there anyway. The eyeliner is not only bold in colour. It also features glitter. I have no idea what this says, but I thought it might be important. It’s probably just a “Caution, do not eat” label. The blue and red eyeliners are more like paintbrushes than the black and brown, which appear to be felt tipped instead of brush. The red acts very much like the blue. It’s thick, but not as thick as the blue, but the colour is much more transparent. I might take multiple layers to make the colour vibrant. On my colour test strip (below) it appears a little muddy, but I’ll let you decide for yourself. I actually avoided using my white pencil because the first thing it done when I used it on the test strip was crumble. Like most art pencils, pencil eyeliners can crack when dropped, and it looks like mine did during shipping. That said, it’s a little gritty due to the glitter/sparkle, and it’s not really white. It’s more like an off-beige with some pink when compared to the white paper (see below). I don’t recommend shipping this if you plan on using it. It might not be worth your time. The red and blue eyeliners take some messing with before you can use them. When you open them their brushes will be white and clear of the liquid. 1. Pull off the plastic tab. 2. Push down the lid. 3. Be sure it is down all of the way. Don’t try and use your thumb like in my photos. Those were just convenient shots because I done photos and movements all alone. I recommend pushing down with the palm of your hand. It might be a little difficult. 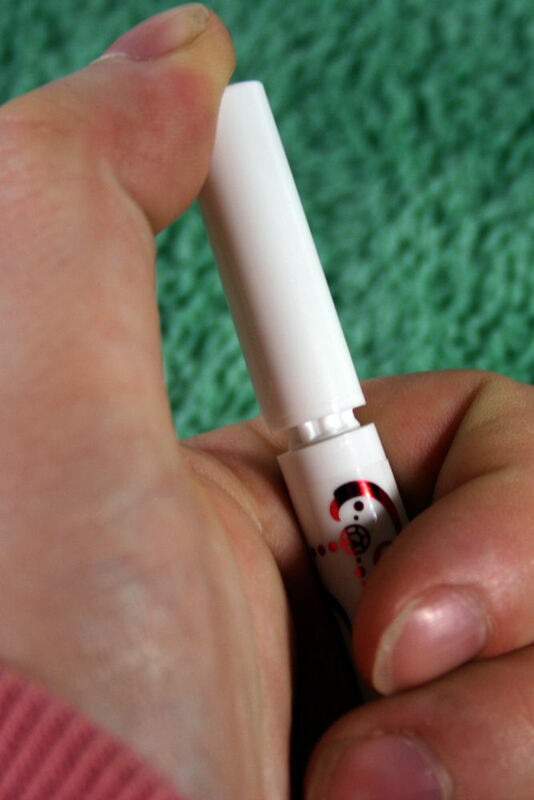 Once the cap has been pushed down you can safely remove it. The brush will still be white and there will be no liquid yet. It is recommended that you leave the cap off during the next step. It is recommended that you have some paper towel or tissue prepped for this step, just in case. 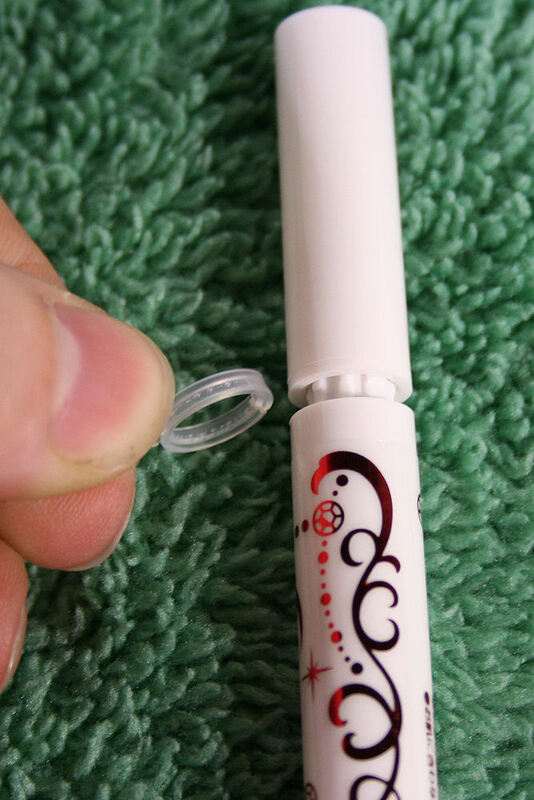 While holding the eyeliner with the tip facing UP twist the bottom of the container counter clockwise. This will push the liquid up into the tip. It does take quite a bit of twisting to get your liquid, but I recommend taking your time as once it DOES make it to the brush it will ooze a little. Now your liquid eyeliner is ready to use!! There are no bootleg items for this product yet. For collectors purposes these are rather redundant unless you enjoy wearing make-up, or like the packaging/look of the items. I only recommend them if you plan on collecting most of the Miracle Romance collection, or plan on wearing them. The products seem to be of decent quality, and the only issues I’ve experienced with them have been due to influences the manufacturer can’t avoid in these products. Overall my personal experience with wearing mostly the black eyeliner has been positive. Even with sensitive skin and allergies this eyeliner does not bother my eyes or skin at all. These have been difficult to find. Pre-orders on the P-Bandai website have closed, but they have appeared on the Japanese Amazon, as well as Jlist. Due to the prices, I highly recommend checking out Amazon before purchasing from Jlist. I purchased mine through a friend in Japan. This review was originally posted by me under the username Paulichu on MFC on December 3, 2013.